HASKO offers panel processing machinery for engineered wood. The HASKO PTU can trim either length or width and comes standard for 48″ to 72″ capacity. Integrated into automated material handling systems, these machines can be configured to trim ends and split long panels if required. Built HASKO-heavy, the machines run in very high volume applications and are ready for multi-shift applications. HASKO Model PTU60 heavy-duty Panel Trim Unit is designed for continuous panel processing for 48” to 60” wide panels. Designed to process both wood veneer cores, MDF and HDF core material. Face veneer can be rotary, sliced or sawn face products up to .125” thick. Feed through design features heavy dual lugged chain feed system with inverter controlled SEW Gear motor. The trim/hogging saws are directly opposed for extreme accuracy and have both vertical and lateral fine adjustments. 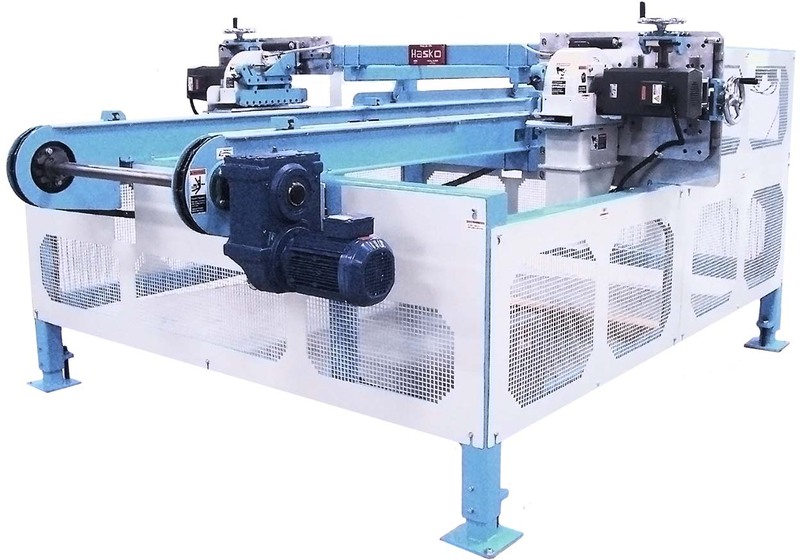 Standard unit is equipped with 7-1/2 HP inverter controlled saw Spindle motors. The cut design includes shearing anvils for complete pneumatic waste removal and discharge that eliminates waste conveyors. The system is equipped with pneumatic roller hold-downs that can be quickly opened for servicing and adjustments.